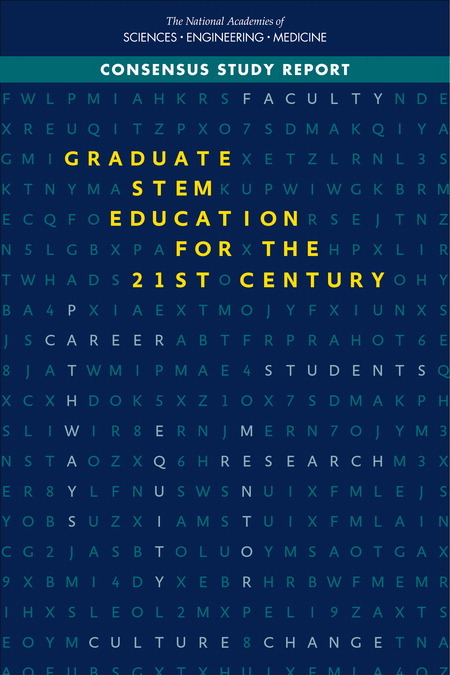 On May 29, 2018, the committee released the consensus report Graduate STEM Education for the 21st Century with a public launch event and webcast. The committee was chaired by former AAAS President Alan Leshner. The report examines the state of STEM graduate- level education in the U.S., revisiting and updating a similar COSEMPUP study completed 20 years ago. Through this study, the committee conducted a systems analysis of graduate education with the aim of identifying policies, programs and practices that could better meet the diverse education and career needs of master’s and Ph.D. graduate students in coming years (and understanding the commonalities and distinctions between the two levels), and also identifying deficiencies and gaps in the system that could improve graduate education programs. 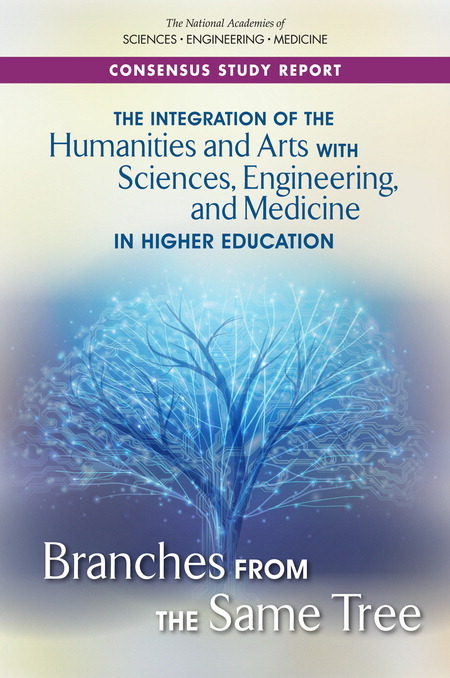 On May 7, 2018, the study committee published the consensus report The Integration of the Humanities and Arts with Sciences, Engineering, and Medicine in Higher Education: Branches from the Same Tree and held a public launch event. This study was designed to offer a greater understanding of the groundswell of programs and courses across the United States—at a range of different institutional types—that are seeking to break down disciplinary “silos” through interdisciplinary, multidisciplinary, and transdisciplinary educational approaches. Under the leadership of David Skorton, the Secretary of the Smithsonian Institution, the committee examined “the evidence behind the assertion that educational programs that mutually integrate learning experiences in the humanities and arts with science, technology, engineering, mathematics, and medicine (STEMM) lead to improved educational and career outcomes for undergraduate and graduate students.” After considering multiple forms of evidence, the committee found that certain approaches to the integration of the arts and humanities with STEMM are associated with positive student learning outcomes; including, but not limited to, written and oral communication skills, teamwork skills, ethical decision making, critical thinking and deeper learning, content mastery, general engagement and enjoyment of learning, empathy, resilience, the ability to apply knowledge in real-world settings, and indicators of improved science literacy. 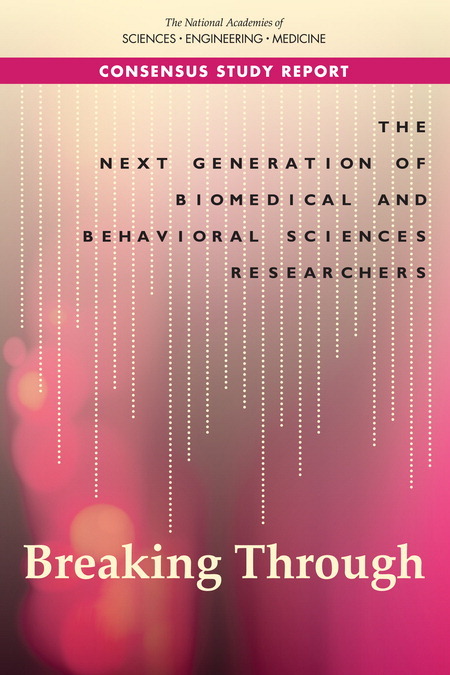 On April 12, 2018, the committee publicly released their consensus report, The Next Generation of Biomedical and Behavioral Researchers: Breaking Through. Chaired by Ron Daniels, President of The Johns Hopkins University, the report focused on evaluating the barriers that prospective biomedical and behavioral researchers encounter as they transition to independent research careers and the extent to which employers (industry, higher education academic institutions, and others) can facilitate these transitions for early career researchers.The report offers a series of recommendations to Congress, NIH, biomedical research institutions, and principal investigators. The report’s aim is to mitigate or prevent the United States from endangering its position as the global leader in biomedical research, and to support the next generation of biomedical researchers as they identify and pursue an independent research career path that best serves them and their community. 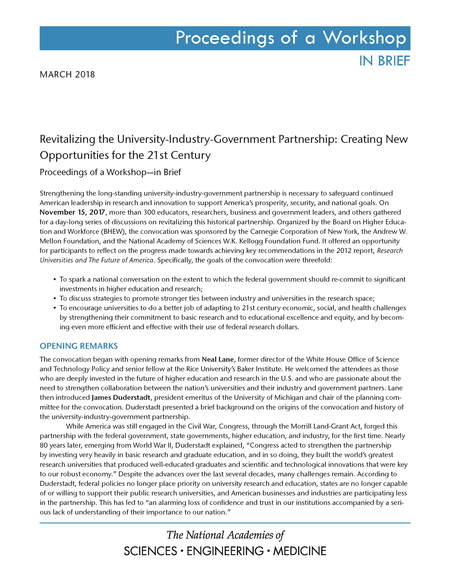 Strengthening the long-standing university-industry-government partnership is necessary to safeguard continued American leadership in research and innovation to support America’s prosperity, security, and national goals. On November 15, 2017, more than 300 educators, researchers, business and government leaders, and others gathered for a day-long series of discussions on revitalizing this historical partnership. This publication briefly summarizes the presentations and discussions from the workshop. 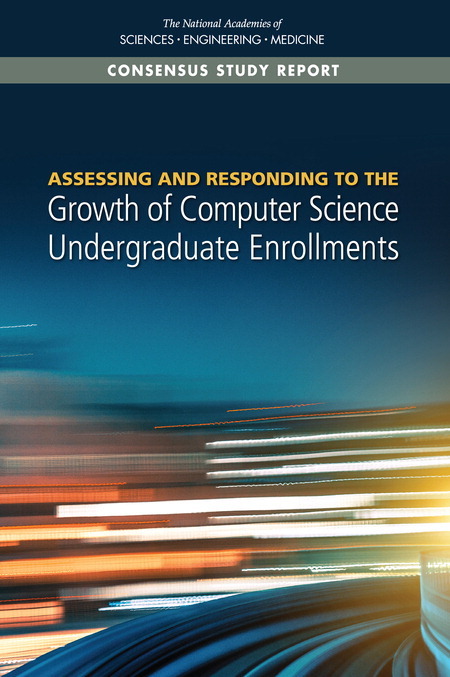 A collaboration with the Computer Science and Telecommunications Board, Assessing and Responding to the Growth of Computer Science Undergraduate Enrollments examines the increasing enrollments in undergraduate CS courses and majors, underlying drivers, and associated diversity implications, with recommendations about how best to respond. 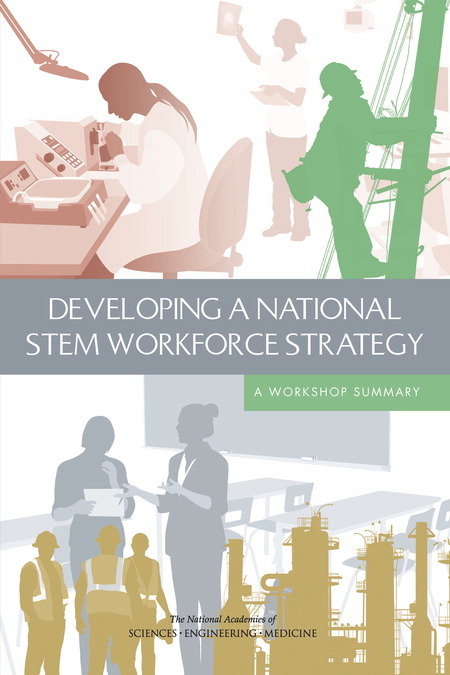 On March 7, 2016, under the auspices of a Board on Higher Education and Workforce (BHEW) planning committee, the National Academies of Sciences, Engineering, and Medicine released a new workshop summary, Developing a National STEM Workforce Strategy: A Workshop Summary. The workshop summary discusses how the future competitiveness of the United States in an increasingly interconnected global economy depends on the nation fostering a workforce with strong capabilities and skills in science, technology, engineering, and mathematics (STEM). STEM knowledge and skills enable both individual opportunity and national competitiveness, and the nation needs to develop ways of ensuring access to high-quality education and training experiences for all students at all levels and for all workers at all career stages. 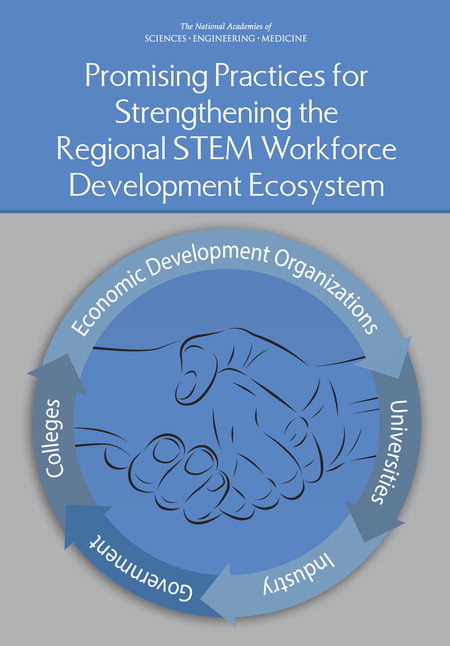 Promising Practices for Strengthening the Regional STEM Workforce Development Ecosystem (2015) This report summarizes an 18-month study on improving higher education’s responsiveness to regional STEM workforce needs. It was conducted by a project committee under the auspices of BHEW, and was sponsored by The Helmsley Charitable Trust. The report’s primary audiences are business and university leaders, key intermediary organizations such as chambers of commerce and regional economic development groups, and state and local government policy makers. The information, findings, and recommendations focus on promising practices that can enable higher education and business to collaborate in sustainable ways that benefit students, universities, companies, regional economies, and national competitiveness. Opportunities for the Gulf Research Program: Middle Skilled Workforce Needs: Summary of a Workshop (2014) The National Academies Board on Higher Education and Workforce was asked to assist the recently established Gulf Research Program in its planning around education and training issues. 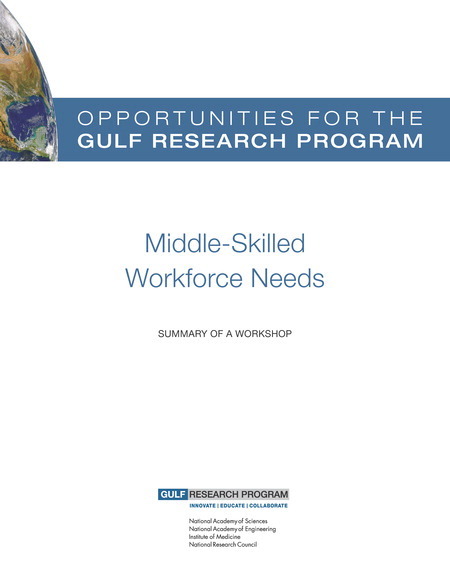 A summary of the June 2014 workshop—Opportunities for the Gulf Research Program: Middle-Skilled Workforce Needs—is now available. Read the Workshop Summary to learn what key thought leaders from the region’s education and employer communities identified as key needs that might be addressed by the Gulf Research Program. Emerging Workforce Trends in the U.S. Energy and Mining Industries (2013) This Congressionally-mandated report examines the short- and long-term availability of skilled workers to meet the needs of the energy and mineral extraction industries in the United States. As the baby boom generation reaches retirement age, the nation is facing the loss of many experienced energy and mining workers in industry, academia, and the government. At the same time, the current educational system is not producing enough qualified workers to fill current and future jobs, which increasingly require science, technology, engineering, and math (STEM) skills. Research Universities and the Future of America: Ten Breakthrough Actions Vital to Our Nation's Prosperity and Security (2012) provides an unparalleled dataset that can be used to assess the quality and effectiveness of doctoral programs based on measures important to faculty, students, administrators, funders, and other stakeholders. The data, collected for the 2005-2006 academic year from more than 5,000 doctoral programs at 212 universities, covers 62 fields. Included for each program are such characteristics as faculty publications, grants, and awards; student GRE scores, financial support, and employment outcomes; and program size, time to degree, and faculty composition. Measures of faculty and student diversity are also included. Improving Measurement of Productivity in Higher Education (2012) This study examines the promise and pitfalls of developing indicators for measuring productivity in higher education at the course, departmental, institutional, and sectoral levels. Community Colleges in the Evolving STEM Education Landscape: Summary of a Summit (2012) Based on a national summit that was supported by the National Science Foundation and organized by the NRC and the NAE, the report highlights the importance of community colleges, especially in emerging areas of STEM (Science, Technology, Engineering, and Mathematics) education and preparation of the STEM workforce. Future U.S. Workforce for Geospatial Intelligence (2012) This study examines, in light of evolving technology, the need for different kinds of geospatial intelligence expertise in the United States compared with the production of experts in the relevant disciplines, and discusses possible ways to ensure adequate availability of the needed expertise. Assuring the U.S. Department of Defense a Strong Science, Technology, Engineering, and Mathematics (STEM) Workforce (2012) This study assesses the science, technology, engineering, and mathematics (STEM) capabilities that the U.S. Department of Defense (DOD) needs to meet its goals, objectives, and priorities; assesses whether the current DOD workforce and strategy will meet those needs; and identifies and evaluates options and recommend strategies that the department could use to help meet its future STEM needs. Workforce Needs in Veterinary Medicine (2012) This study examines workforce needs in the veterinary medical workforce, including demographics, workforce supply, trends affecting job availability, and capacity of the educational system to fill future demands. The study found that the profession faces important challenges in maintaining the economic sustainability of veterinary practice and education, building its scholarly foundations, and evolving veterinary service to meet changing societal needs. Assuring a Future US-based Nuclear and Radiochemistry Expertise (2012) This study examines supply and demand for expertise in nuclear chemistry and radiochemistry in the US compared with the production of experts with these skills, and discusses possible approaches for ensuring adequate availability of these skills, including necessary training platforms. It presents possible approaches for ensuring adequate availability of these skills, including necessary science and technology training platforms. Research Training in the Biomedical, Behavioral, and Clinical Research Sciences (2011): Comprehensive research and a highly-trained workforce are essential for the improvement of health and health care both nationally and internationally. During the past 40 years the National Research Services Award (NRSA) Program has played a large role in training the workforce responsible for dramatic advances in the understanding of various diseases and new insights that have led to more effective and targeted therapies. In spite of this program, the difficulty obtaining jobs after the postdoc period has discouraged many domestic students from pursuing graduate postdoc training. In the United States, more than 50 percent of the postdoc workforce is made up of individuals who obtained their Ph.D.s from other countries. Indeed, one can make a strong argument that the influx of highly trained and creative foreigners has contributed greatly to U.S. science over the past 70 years. A Data-Based Assessment of Research-Doctorate Programs in the United States (2011): provides an unparalleled dataset that can be used to assess the quality and effectiveness of doctoral programs based on measures important to faculty, students, administrators, funders, and other stakeholders. Expanding Underrepresented Minority Participation: America's Science and Technology Talent at the Crossroads (2011): In order for the United States to maintain the global leadership and competitiveness in science and technology that are critical to achieving national goals, we must invest in research, encourage innovation, and grow a strong and talented science and technology workforce. Expanding Underrepresented Minority Participation explores the role of diversity in the science, technology, engineering and mathematics (STEM) workforce and its value in keeping America innovative and competitive. According to the book, the U.S. labor market is projected to grow faster in science and engineering than in any other sector in the coming years, making minority participation in STEM education at all levels a national priority. Science Professionals: Master’s Education for a Competitive World (2008): What are employer needs for staff trained in the natural sciences at the master's degree level? How do master's level professionals in the natural sciences contribute in the workplace? How do master's programs meet or support educational and career goals? Science Professionals: Master's Education for a Competitive World examines the answers to these and other questions regarding the role of master's education in the natural sciences. The book also focuses on student characteristics and what can be learned from efforts underway to enhance the master s in the natural sciences, particularly as a professional degree. This book is a critical tool for Congress, the federal agencies charged with carrying out the America COMPETES Act, and educational and science policy makers at the state level. Additionally, anyone with a stake in the development of professional science education four-year institutions of higher education, students, faculty, and employers will find this book useful. Review of the Naval Sea Systems Command (NAVSEA) Draft Memorandum: "NAVSEA's 21st Century Engagement, Education, and Technology Initiative" (2008): An ad hoc committee will review the draft Department of Navy memorandum, "21st Century Engagement, Education, and Technology Initiative" in light of the recent National Academies report, "Rising Above the Gathering Storm." This publicly available memorandum articulates a plan for NAVSEA to address the shortage in the Science, Technology, Engineering, and Mathematics (STEM) professional workforce that is vital to its mission success. The committee will advise on the viability and implementation of the activities proposed in the memorandum: activities to generate interest and capability in STEM in K-12 and higher education; engaging academia and industry; and efforts to improve recruiting and retention of STEM workers within NAVSEA and the Navy. The committee will prepare a brief report detailing its advice and recommendations. Approaches for Evaluating the NRC Resident Research Associateship Program at NIST (2007): The NRC Resident Research Associateship Program at NIST provides two-year temporary appointments for outstanding scientists and engineers. This book describes program applicants and awardees and offers suggestions for an in-depth assessment of career outcomes. Preliminary investigation indicates that outreach efforts produce more qualified applicants than NIST has slots to fill, the pool of applicants is increasingly diverse, and many Research Associates go on to permanent positions at NIST. The agency should conduct a more thorough evaluation of the program, including an assessment of outreach to potential applicants, individuals who decline an award, the program s impact on the careers of awardees, and the benefits of the program to NIST and the broader scientific and engineering community. Evaluation of the Markey Scholars Program (2006): The last of five in a series evaluating the grant programs of the Lucille P. Markey Charitable Trust, this report examines the Markey Scholars Awards in Biomedical Sciences. The Scholars program awarded more than $50 million to outstanding young investigators as postdoctorates and junior faculty. Using analysis of curriculum vitae, data on citations and grants, and interviews, the report examines the career outcomes of Scholars relative to those of individuals who applied for the Scholars award. The authoring committee concludes that the Scholars program was a success and provides a template for current programs designed to address the career transitions of young investigators. Funding Biomedical Research Programs: Contributions of the Markey Trust (2006): This is the second of five reports to emerge from the evaluation of the Markey Trust. As part of this assessment, the NRC hosted a scientific conference for Markey Scholars and Visiting Fellows in Rio Grande, Puerto Rico on June 28-30, 2002. The purpose of the conference was to enable the Scholars and Fellows to share their research experiences, just as they did at the annual Scholars Conferences previously conducted by the Markey Trust. All of the attending Scholars and Fellows submitted abstracts of their poster sessions. Six scholars, along with other experts in the biomedical sciences, made formal presentations. These proceedings consist of shortened versions of the individual presentations and the poster session abstracts. Enhancing Philanthropy's Support of Biomedical Scientists: Proceedings of a Workshop on Evaluation (2006): During an interval of 15 years, the Lucille P. Markey Charitable Trust spent over $500 million on four programs in the basic biomedical sciences that support the education and research of graduate students, postdoctoral fellows, junior faculty, and senior researchers. The Markey Trust asked the NRC to evaluate these programs with two questions in mind: “Were these funds well spent?” and “What can others in the biomedical and philanthropic communities learn from the programs of the Markey Trust, both as an approach to funding biomedical research and as a model of philanthropy?” One of five resulting reports, this volume contains the proceedings of a workshop held in June 2005 to investigate methods used to evaluate funding of the biomedical scientists by philanthropic and public funders. In addition to the Markey Trust, representatives from the Howard Hughes Medical Institute, the American Heart Association, the Doris Duke Charitable Foundation, the National Institutes of Health, and six other funders of biomedical scientists presented information on evaluation methodologies and outcomes. Advancing the Nation's Health Needs: NIH Research Training Programs (2005): This report is the twelfth assessment of the National Institutes of Health National Research Service Awards program. The research training needs of the country in basic biomedical, clinical, and behavioral and social sciences are considered. Also included are the training needs of oral health, nursing, and health services research. The report has been broadly constructed to take into account the rapidly evolving national and international health care needs. The past and present are analyzed, and predictions with regard to future needs are presented. Assessment of NIH Minority Research Training Programs (2005): This report provides an assessment of NIH’s programs for increasing the participation in biomedical science of individuals from underrepresented minority groups. The report examines, using available data and the results of a survey of NIH trainees, the characteristics and outcomes of programs at the undergraduate, graduate, postdoctoral, and junior faculty levels. The report provides recommendations for improving these programs and their administration. It also recommends how NIH can improve the data it collects on trainees in all NIH research training programs so as to enhance training program evaluation. PolicyImplications of International Graduate Students and Postdoctoral Scholars in the United States explores the role and impact of students and scholars on US educational institutions and the US economy. The nation has drawn increasingly on human resources abroad for its science and engineering workforce. However, competition for talent has grown as other countries have expanded their research infrastructure and created more opportunities for international students. The report discusses trends in international student enrollments, including, and examines the impact of visa policies on international mobility of the highly skilled. Community colleges play an important role in starting students on the road to engineering careers, but students often face obstacles in transferring to four-year educational institutions to continue their education. Enhancing the Community College Pathway to Engineering Careers, a new book from the National Academy of Engineering and the National Research Council, discusses ways to improve the transfer experience for students at community colleges and offers strategies to enhance partnerships between those colleges and four-year engineering schools to help students transfer more smoothly. In particular, the book focuses on challenges and opportunities for improving transfer between community colleges and four-year educational institutions, recruitment and retention of students interested in engineering, the curricular content and quality of engineering programs, opportunities for community colleges to increase diversity in the engineering workforce, and a review of sources of information on community college and transfer students. It includes a number of current policies, practices, and programs involving community college four-year institution partnerships. The United States economy relies on the productivity, entrepreneurship, and creativity of its people. To maintain its scientific and engineering leadership amid increasing economic and educational globalization, the United States must aggressively pursue the innovative capacity of all its people-women and men. However, women face barriers to success in every field of science and engineering, a record that deprives the country of an important source of talent. Without a transformation of academic institutions to tackle such barriers, the future vitality of the U.S. research base and economy is in jeopardy. The report describes how eliminating gender bias in academia requires overarching reform now, including decisive action by university administrators, professional societies, federal funding agencies and foundations, government agencies, and Congress. If implemented and coordinated across public, private, and government sectors, the recommended actions will help to improve workplace environments for all employees while strengthening the foundations of America's competitiveness. Although more women than men participate in higher education in the United States, the same is not true when it comes to pursuing careers in science and engineering. This report identifies and discusses better practices for recruitment, retention, and promotion for women scientists and engineers in academia. Seeking to move beyond yet another catalogue of challenges faced by women in academic science and engineering, this book describes actions actually taken by universities to improve the situation for women. This guide offers numerous solutions that may be of use to other universities and colleges and will be an essential resource for anyone interested in improving the position of women students, faculty, deans, provosts, and presidents in science and engineering. Based on a 2003 workshop, this study describes current public and private programs and recommends ways to recruit and retain more women and underrepresented minorities into clinical research, especially physician-scientists and nurses. Federal sponsors should improve data collection, evaluate existing training programs, and increase the diversity of study section review panels. Public and private sponsors should create funding mechanisms with flexible career paths, and universities and professional societies should both play enhanced roles in fostering diversity. A significant push is needed to recruit minorities into nursing and provide more clinical research training for nurse-scientists, nursing students, and nursing faculty. To order any of these publications or other documents from the National Academy of Sciences, National Academy of Engineering, Institute of Medicine, or National Research Council please contact the National Academy Press at: (800) 624-6242 or (202) 334-3313; or you may visit the Academy bookstore on 500 Fifth Street, NW, Washington, DC 20001; (202) 334-3980. Please note, many of our publications can be read online free of charge.